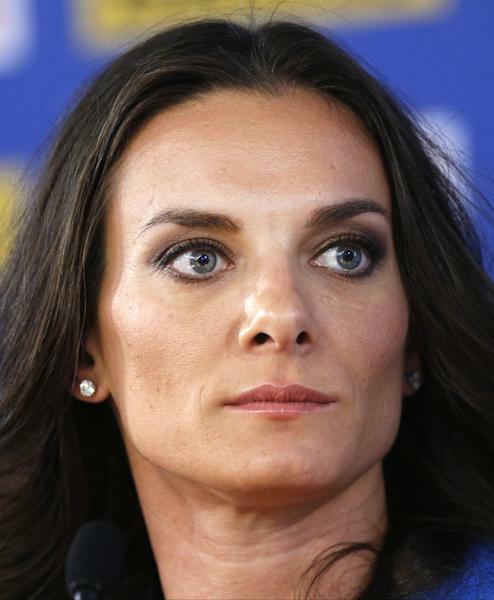 MOSCOW (AP) — Russian pole vaulter Yelena Isinbayeva's comments on her country's law against gay "propaganda" seemed as unequivocal as the bar-clearing jump that won her the world championship: She supported the law and derided gays. But on Friday, Isinbayeva said that her comments, in somewhat fractured English the day before, may have been misunderstood and that she opposes any discrimination against gays. The clarification — or U-turn — underlined the sensitivity of the issue for Russia as international criticism of the law persists and calls continue for a boycott of next February's Winter Olympics in the Russian resort of Sochi. The Olympics, like the world championships where Isinbayeva won gold and made her comments, are part of a series of major sports events that Russia hopes will showcase the country as sophisticated and forward-looking. The propaganda law has instead provoked criticism that Russia is retreating from the modern world. Isinbayeva's comments were especially dicey for Russia's image. Not only is she an internationally popular athlete both for her skills and exuberance, but she is also the "mayor" of one of Sochi's two Olympic villages, an honorary but symbolic and visible role. "She is a very recognized figure around the world. And I think she should be thinking of what she is saying," said Nikolai Alexeyev, Russia's most prominent gay-rights activist. "I am not surprised that the story is starting to develop and she has to find an excuse for what she said." In a news conference on Thursday, the two-time Olympic gold medalist supported the Russian law and criticized two Swedish competitors for their rainbow-colored fingernails in support of gay rights. "If we allow to promote and do all this stuff on the street, we are very afraid about our nation because we consider ourselves like normal, standard people. We just live with boys with woman, woman with boys," she said. But on Friday, after her comments attracted international attention, Isinbayeva said, "English is not my first language, and I think I may have been misunderstood when I spoke yesterday." "What I wanted to say was that people should respect the laws of other countries, particularly when they are guests. I respect the views of my fellow athletes, and let me state in the strongest terms that I am opposed to any discrimination against gay people," she said in a statement released by local organizers of the championships. The law penalizes anyone who distributes information aimed at persuading minors that "nontraditional" relationships are normal or attractive. It appears that anyone wearing a rainbow flag on the street or writing about gay relationships on Facebook, for instance, could be accused of propagandizing. The law has raised concern about how gay athletes might be treated in Sochi. Russian officials have made contradictory statements about whether the law would be enforced during the games, and the International Olympic Committee has asked for clarification. Foreigners found guilty of violating the law could be imprisoned for 15 days and deported. "The Games themselves should be open to all, free of discrimination, and that applies to spectators, officials, media and of course athletes," Claudia Bokel, chair of the IOC's Athletes' Commission, said on her Twitter account. "We would oppose in the strongest terms any move that would jeopardize this principle." Both the law and Isinbayeva's first comments appear to have placed other Russian athletes in a quandary — support for individual rights vs. support for their country. "On the one hand, you have to respect everybody's individuality, the interests of other people. On the other hand, you have to look at the history of each country. Every country has its own traditions," Russian triple jumper Aleksey Fedorov said Friday. Steve Cram, the British runner who won the first 1,500-meter gold medal at the 1983 world championships, competed in the 1980 Moscow Olympics, when many other Western countries refused to go for political reasons. "I don't believe in boycotts," Cram said in Moscow. "I think situations like that should be aired, should be allowed to be aired and spoken about by anyone who wants to. People should be allowed to give their opinions. I don't agree with her opinions. I don't agree with the (Russian law), but that's my personal opinion." Usain Bolt, who won the 100 meters at the world championships and was looking for a second gold medal in the 200, said: "I'm always neutral. I don't get into politics. I'm all about running. This is what I come here to do, to compete and to inspire the fans, inspire athletes." But he also said: "If you have an opinion on something, if you feel comfortable in talking about it, then shouldn't be a problem." Though Russia decriminalized homosexuality in 1993, antipathy toward gays has been widespread and longstanding in Russia. A survey by the independent Levada Center polling agency released a week after the law was passed found 76 percent of Russians supported it and 17 percent opposed it. Although Isinbayeva's comments Thursday received wide attention in the West, Russian media gave them little or no attention. The sports newspaper Sport-Express ran a roundup of foreign comment on the issue on its website but not in its print edition. AP Sports Writer Pat Graham and Associated Press writer Alexander Roslyakov contributed to this report.